Cheap flights Brussels Zanzibar, Jamaica, Cuba,Dominican Republic €272! British Airways cheap return flights to Mahé, Seychelles from €410! Lufthansa flights from Dublin to India from €366 return! Cheap flights Brussels to Zanzibar, Jamaica, Cuba, Dominican Republic for €272! Charter airlines TUIfly Belgium have just released new set of discounted flights from Brussels to various exotic destinations in the Caribbean Sea as well as Africa or North America. Since there are many very attractive routes available at this moment we have decided to summarize all the most interesting deals in this article. At this moment you can book very cheap flights Brussels to the Dominican Republic. (Punta Cana but also to Puerto Plata or Santo Domingo). Cuba or Jamaica. In Africa you can visit Gambia, Cape Verde, beautiful Zanzibar or Mombasa in Kenya. Also adding deals to North America (USA – Miami or Mexico – Cancun). You can book the cheapest flights for €272. (Flights to Gambia / Cape Verde from €192). Note that fare is for a round trip (direct service) incl. all taxes and feesand meals however there is no hold bag in base fare. (You would have to purchase separately during the booking process). This TUIfly Belgium promotion is (in most of the cases) kind of a last minute deal. You will find the chepaest flights from Brussels in November or first half of December 2018. Some routes (e.g. to Punta Cana / Puerto Plata / Santo Domingo) are available also in January 2019. This offer is based on direct booking with the airlines where you can easily compare all the cheapest flights available. As mentioned there is no hold bag in base fare. The fee should have been €23 per flight on the long haul flights. Medium-haul from €18 per segment. Need affordable accommodation in one of those tropical destinations in the Caribbean, Africa or America you can use service of Booking.com. Also consider currently valid Hotels.com promotion code. Booking sample of TUIfly Belgium discount offer to various destinations in Caribbean or Africa below. 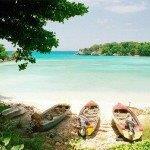 Currently you can book very cheap flights Brussels to Zanzibar, Jamaica, Cuba, Dominican Republic for €272! As per our booking sample you would depart from Belgium to Zanzibar, amazing archipelago off Tanzania´s coast on 7th of December. Return from Africa back to Brussels on 14th of December 2018.